I was born and brought up in Orkney and played piano accordion from the age of 5 up to my late teens, mostly by ear (and a few piano lessons). When I moved from Scotland to work in Surrey in my late 20s, I soon happened upon morris dancing and was so intrigued by the melodeons their musicians used that I bought one to see what it was like to play. I played for a couple of morris sides for a while, then joined up with an accordionist and fiddler from there to form a barn dance band. In looking at ways to develop the band’s repertoire I was encouraged to re-visit the tunes and playing of my early years in Scotland, which drew my attention back to the piano accordion. I acquired an old model cheaply and was soon back playing and loving it, and upgrading to a decent accordion. I always have an ear out for interesting new tunes from the playing of other bands, musicians and YouTube trails, and enjoy combining tunes of similar structure into sets, separated by key changes that give a real lift to the music and dancers – it is both the tunes and the combinations that I am keen to share in this blog. I have played for morris dancing on and off for many years, and latterly spent time thinking about and developing more interesting bass accompaniment (rather than just the usual oom-pah). I have recently taken up Scottish Country Dancing (SCD) (as a dancer) which means I am hearing a huge range of SCD tunes, many of which I think: “Oh, I really would like to play that”). I have been adding them to a list and have recently started compiling them into sets and learning to play them proficiently – some can be quite challenging, but I just play these at a more steady pace. 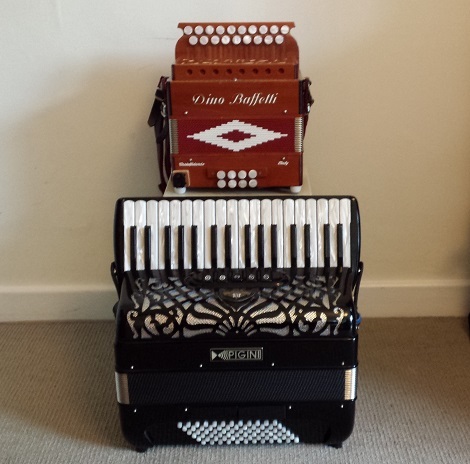 In parallel with playing accordion and melodeon I have learned a great deal about the instruments, especially through acquiring different models, trying different tunings, getting modifications done, etc. I plan to recount some of this in future articles.